On January 17, 1918, the U.S. War Department hired a New York engineering firm to build a nitrocellulose plant along the Kanawha-Putnam county border. 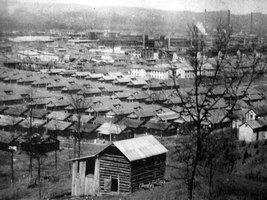 The DuPont Company had previously chosen the site to manufacture munitions for World War I. Within 11 months, workers—including a young Clark Gable—had built the town of Nitro. However, there were political objections to one company receiving such a large contract, so DuPont abandoned its plans, and the federal government picked up the task. Within 11 months, workers—including a young Clark Gable—had built the town of Nitro, containing a large munitions plant, a civic center, a hospital and worker houses, which were segregated by race and nationality. In November 1918, just as Nitro was nearing completion, World War I ended. The munitions plant had been in partial operation for only a week. The army inventoried and sold off the plant to the Charleston Industrial Group, which marketed the facilities to chemical companies. In 1937, one of these companies, American Viscose, built the largest staple rayon plant in the world at Nitro. Over the years, Nitro was home to at least 17 different chemical companies, including Ohio Apex Chemical, Monsanto, and Fike Chemical.